At 5:30 a.m. on Saturday during a bye week for the San Francisco 49ers and five other NFL teams, most of the Niners were probably still asleep. 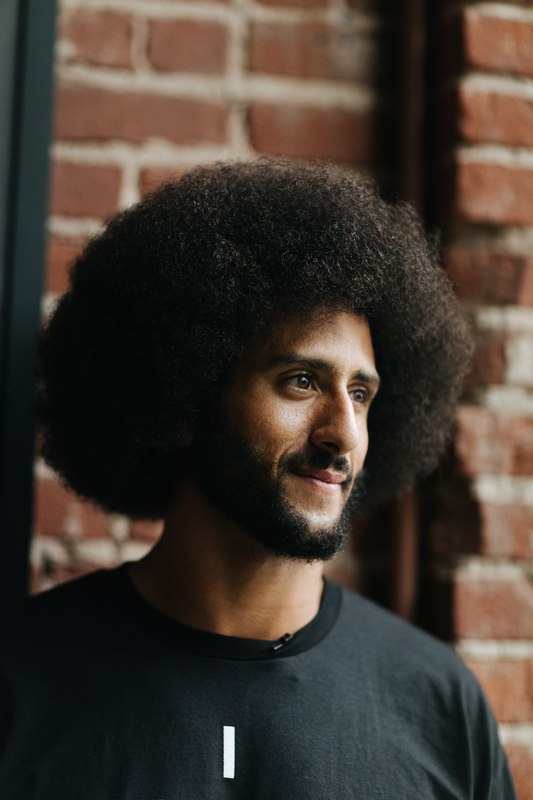 But quarterback Colin Kaepernick was wide awake in downtown Oakland, California, anxiously awaiting an opportunity to host underprivileged Bay Area children during his own private event. “I’m going on only two hours of sleep. I’m anxious,” Kaepernick told The Undefeated. There were homeless kids living in a halfway house on the way. Kids from underprivileged neighborhoods in Oakland, Richmond, and San Francisco were also en route. Speakers talking about how to protect yourself in police interactions, holistic healing and natural organic nutrition, loving yourself and the community, financial knowledge, higher education and law enforcement history were on the way, too. San Francisco 49ers Quarterback Colin Kaepernick speaks with teens during an event at the HUB Oakland on September 29, 2016 in Oakland, CA. The event was to educate the youth in Oakland about their rights especially when dealing with the police. Kaepernick was staying true to his word by hosting the “Know Your Rights” camp at a community event center called HUB Oakland that had pictures on the wall honoring the Black Panthers and other African-American heroes. The 28-year-old sparked national conversation after refusing to stand for the national anthem before NFL games this preseason and regular season to protest what he has previously described as racist police practices and the continued oppression of his fellow African-Americans. Kaepernick previously pledged $1 million to community organizations and funded this event himself. 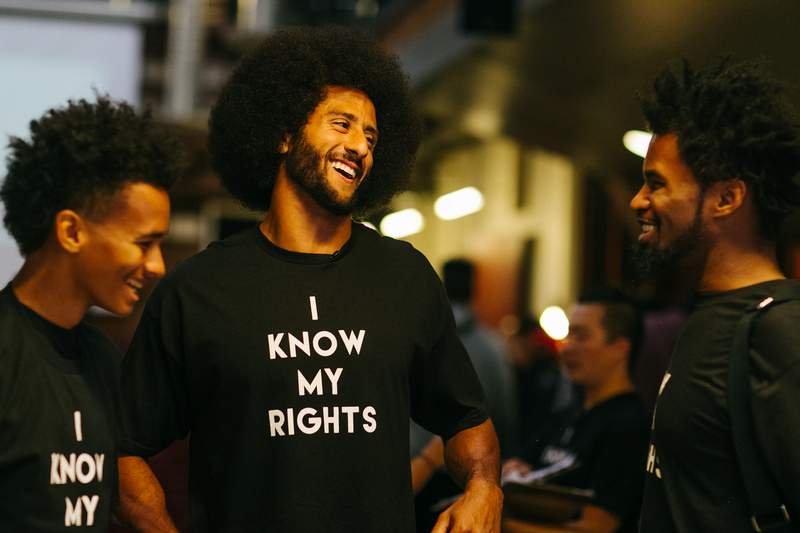 Dressed in all black and wearing a T-shirt that read, “I KNOW MY RIGHTS,” with his Afro in full bloom, Kaepernick took part in a Q&A with The Undefeated before his event began. Colin Kaepernick talks about how he has been touched by the support he has received in his national anthem protest against racial injustice and how he has not focused on negative comments. It’s 7 a.m. on a Saturday, and you’ve already been here since 5:30 a.m. Most football players are probably enjoying their bye week or sleeping. Can you explain what you’re doing here? So, myself, my woman, our friends, we came together, we created the [“Know Your Rights”] camp that we wanted to bring to underprivileged communities. Starting first in the Bay Area, trying to reach San Francisco, Oakland, Richmond, communities that are truly affected by a lot of the oppressive issues that we’re facing today. And we want to help bridge that gap, give these kids resources to try to help them advance in life, and give them some of the same opportunities that other people have and have the luxury of having. It sounds like you created this yourself. This is your program. This is something that you and your crew set up. How would you explain that? It’s something that from top to bottom we’ve done on our own. There’s no corporation that’s behind this. This is us. On the groundwork, grassroot level, putting this together to try to really make an impact and not have our message skewed or manipulated by a corporate influence. Can you talk about today’s program and what you’re hoping to accomplish? What we are trying to accomplish is giving these kids resources in a lot of different areas. Mainly focusing on the history of policing, what their rights are currently. We have speakers coming in for that, as well as holistic health, financial literacy, education aspect, as well as ‘know yourself, know your community.’ All of these are building blocks that we want to give them, knowledge, give them education on, to make sure they have as many tools, as many advantages as we can give them in a day, to make sure that they have opportunities moving forward to be successful. How were these kids chosen? We had different organizations we reached out to, different schools we reached out to, to grab these kids, bring them here today and make sure that they are coming from these neighborhoods that are so badly affected by these issues. 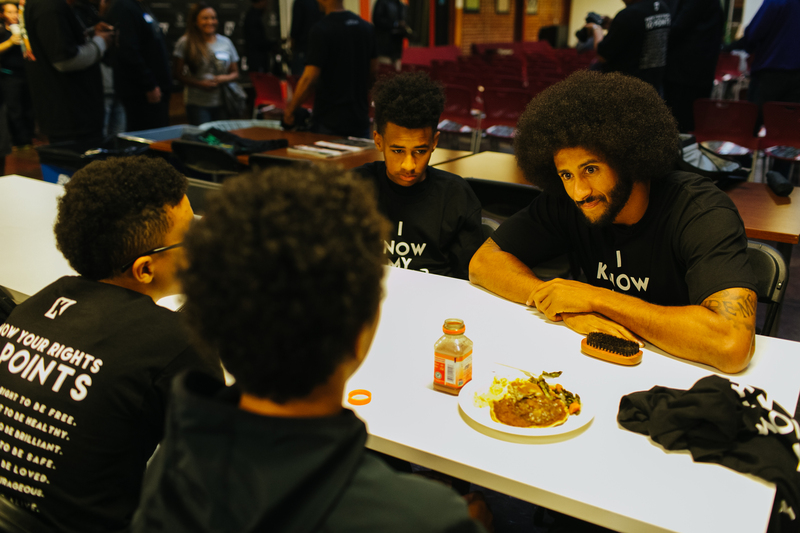 San Francisco 49ers Quarterback Colin Kaepernick talks with children over lunch at the HUB Oakland on September 29, 2016. There is a man speaking to the kids today about how to act and communicate in police encounters and the steps to protect yourself properly with law enforcement. What are your thoughts about this session? Do you believe that all African-Americans should take a similar course? That’s a session that’s very important. It’s much needed, especially in the climate of our country is in right now. You have unarmed children being murdered, and you have unarmed adults being murdered. So, it’s affected all ages of people of color, and to try to give them knowledge of how to help de-escalate those situations, even though that shouldn’t be their responsibility. What comes to mind when you see all these young black children come into this event today? When you started the protest, did you think it would ignite a nationwide movement? And what have you seen that has most touched you and probably most hurt you? 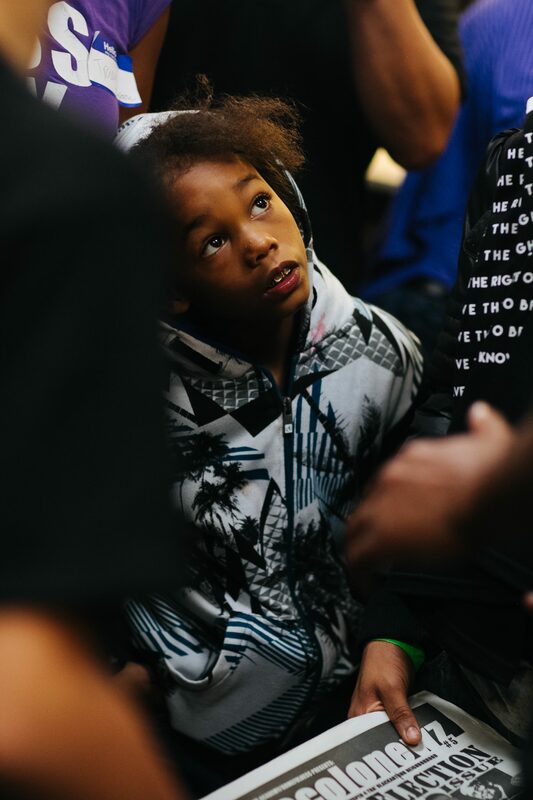 A child looks up to San Francisco 49ers quarterback Colin Kaepernick while he talks to guests during the event at the HUB Oakland on September 29, 2016. And things that hurt I haven’t really focused on that too much. Because, part of the oppressive system is you’re going to have that backlash for trying to fight for people. And that was something that I was fully prepared for, fully aware of, so when those things came, it was expected. It wasn’t an issue for me. The support is really what to me was huge and really gave me excitement, gave me life, as far as people are seeing this the same way I am, and now we can help create change. Was there any story in particular? I heard about a girl with a boot who hopped across the street crying to say hi to you. You hear anything that stands out? Just in everyday walks of life, the amount of people that have come up and just said, ‘I really support you. Thank you.’ And people saying, ‘I’ve had more conversations about this in the last couple months than I’ve had in my entire life.’ And now those conversations are happening, and that spreading of knowledge is happening, where you start to break down ignorance, you start to break down those prejudices, because the truth is coming out about these issues. Do you feel extra pressure now that you’re playing to succeed on the football field in order to keep promoting what you’re doing? No, for me, football is my job. That is that aspect of my life. This is part of who I am as a human being … That’s my profession, that’s what I do in that aspect of my life. This is who I am as a human being and what my beliefs are. So, for me, that’s completely separate. Although football does give you the platform to be heard, ultimately these issues exist whether or not football exists. So, it’s not something that is related to football. Football just allows a platform to have conversations on a greater extent about these issues. Looking back, is there anything you wish you would’ve done and said differently through your protest? Is there anything that you think is misconstrued that you’d like to clear up? No, there’s not anything I would do differently because, once again, this is what I believe, and this is something I have great confidence in, great conviction in. There’s nothing that anybody is going to say that’s going to change how I feel about these issues. And there have been quite a few things that are misconstrued and different narratives that have been pushed. But ultimately that’s because of the system we function in. And the oppressive nature of the system is, it will always fight against people trying to correct those systems, and those systems of privilege, and balance the scales out. So, those are things that once again are expected, but ultimately, you know, we continue to fight against those. You have two other intriguing programs. One is about finance and one is about holistic living. Can you explain both of those, and what impact you want to have on the kids with that? Finance is something that has always impacted communities of color. And being able to have that financial literacy where you know how to operate within a banking system and how to save money, and when you do get money and you have a little bit extra. ‘All right, how do I make that as beneficial as it can be for me and for my family?’ And some of those aspects where you don’t really get those resources in school. 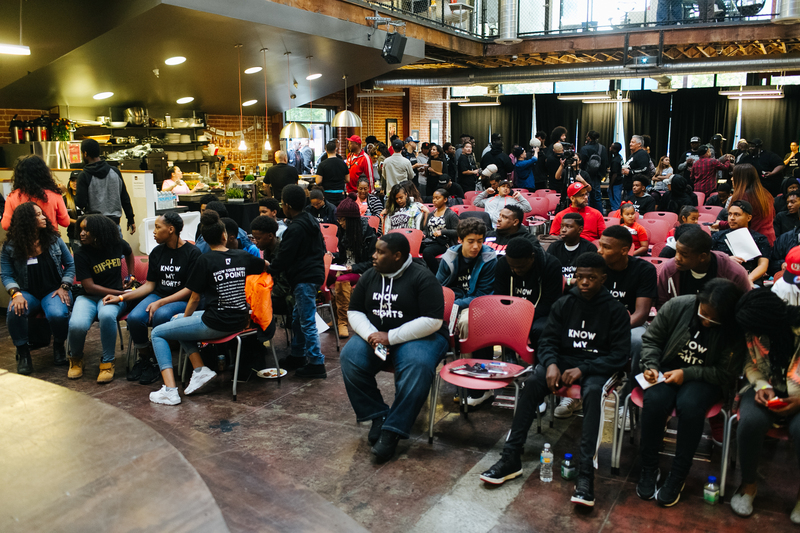 Invited children and teenagers sit while waiting for the event to begin at the HUB Oakland on September 29, 2016. They’ll teach you more math, but they won’t teach you that financial aspect to help you grow and build. And the holistic health part. A lot of these communities are also food deserts, where they don’t have the same resources. And how do we help them eat healthier and do it in a way that’s financially efficient for them? You can’t just run to a grocery store and grab a bunch of organic food, but here are some better options that you might have. Or if you’re going to this restaurant or this fast-food place, here are options that are healthier than what you may be eating currently. You have committed $1 million of your own money to communities in need. How much is financial independence key to achieving social justice for African-Americans? That’s a huge part of it. An event like today I’ve been able to put on because of my financial stability, and to be able to have that as a community is something that we need. To be able to have that independence, and to be able to provide for our own, that’s something that has to happen in order for us to be able to really put pressure on systems to change and to respect us and treat us as human beings. And that goes into the ‘know yourself’ aspect of this, of, ‘Now I know who I am, I know where I’m from, I know what this means to me.’ And having that empowerment, that self-confidence, what self-love, where you’re not going to disrespect me, because I know I’m worth it and I know I respect myself. What type of community impact are you trying to have with this event and in general with what you’re doing? Colin Kaepernick poses for a photo at the HUB Oakland on October 29, 2016 in Oakland, CA. Kaepernick led a discussion with young African American males about their rights, especially when dealing with police officers. How do you explain to the kids what your whole movement is? How do you explain to a teenager and younger kids about what’s going on? I think it’s something that a lot of them see because they experience it on a daily basis, they live it on a daily basis. How I try to portray that to them is just my genuine excitement in them. The fact that they can be the change. There have been so many great leaders that have been from the youth that have risen up and created great change in this country in a lot of different ways. So, for me, that’s what I see when I see these kids is … This might not be something where I personally can create the change that this system needs. But together we can build this and help organize and create the change that we need.